Hey everyone! So now I've had a good few months to test out the Action Sport Games Scorpion Evo 3A1 I feel like I can write a thorough review on it, so without further adue, I give you my thoughts on the ASG Scorpion Evo 3A1. 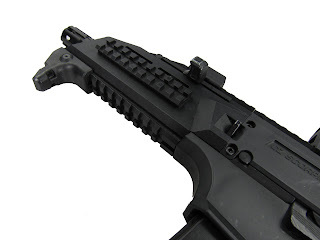 Since the launch of the Action Sport Games CZ Scorpion Evo in 2014 it is fair to say that this particular weapon has been extremely well received by the Airsoft community and has gained itself a reputation of being a high quality AEG out of the box that stands toe to toe with many of its more expensive rivals, but how does it look? How does it perform? Before we get into the internals etc let's talk about the aesthetics of the Evo! Out of the box the first thing I noticed is the smooth branded reinforced polymer body that imitates the real deal with a metal flash hider, dust cover and charging handle. 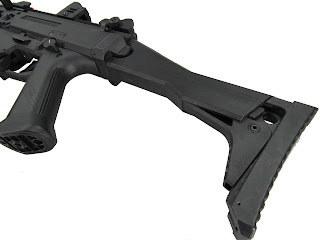 It comes standard with an 3 point adjustable fold to the side stock - which is pretty handy when playing tight CQB games, its branded pistol grip is sturdy, smooth and ergonomic for comfort and the gun also features 4 20mm rails for accessories such as the removal ironsights - as you can see from the photo above I have added a front support set and real steel Shield SMS red dot optic. The front end is quite boxy/stubby compared to the rest of the weapon as it holds the guns power source but it is still comfortable to use. The internals and construction however, are what I would consider sets this weapon apart from the scores of AEGs out on the market today. 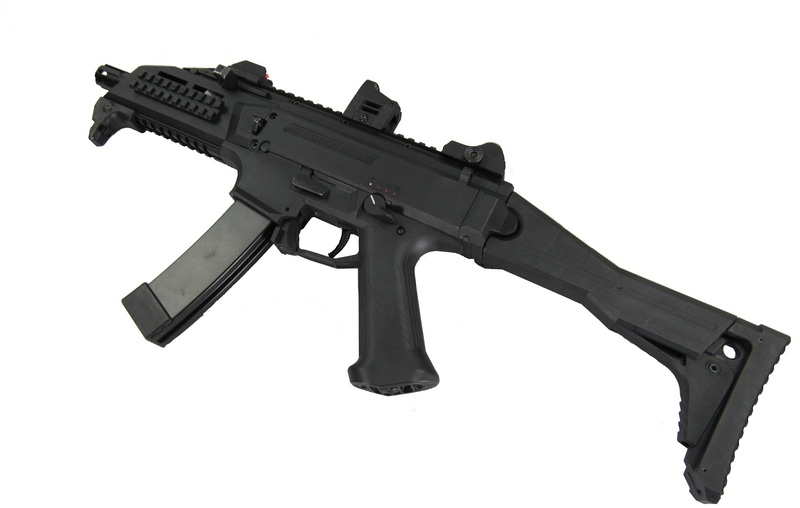 The Evo 3 is built from fiber-reinforced polymer, the same material as its real steel counterpart, making its as tough as the CZ Scorpion Evo and has been designed to have less internal parts than most Airsoft guns (less there is, less things to go wrong right?) The gearbox and custom electronics, like most of the Evo's internals have been specially designed for the Evo to deliver the advance functions. The gearbox has been designed with an innovative electronic control unit which offers benefits to the end user including increased battery and motor efficiency and a crisp trigger response and this is all down to the reduced amount of mechanical and electronic parts. I particularly like the quick change spring access. As standard the Evo as comes with a 6.03mm precision inner barrel. In regards to FPS, out of the box my Evo was shooting 380 FPS on the standard spring so as you can imagine, it was wayyy too hot to use at CQB games so I dropped in an M95 spring and it now shoots around 312 FPS. Featuring a snappy ambidextrous fire selector that has 4 positions - safe, semi, 3 round burst and full auto. I am really impressed with the three round burst on this although as I play almost exclusively CQB I don't get to play with this option very often, I also really like the sharp click when the selector finds its position and snappy trigger. 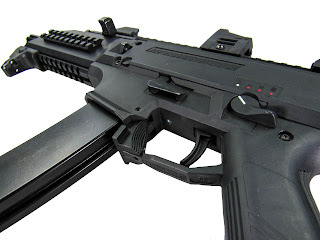 As I said earlier on in the review, the Evo has been designed to mimic the real steel version of this gun and it stops firing when the magazine is empty and requires activation of the bolt catch after a fresh mag has been inserted just like its counterpart. In regards to what battery to use - it can run on both a 7.4 or 11.1 Lipo and last all day however you will get better performance from an 11.1 Lipo. I can't complain about the range of the rifle - for such a small, compact weapon it has the range of a much longer barreled AEG which makes this the perfect choice for Urban or Woodland games but the light, small and compact design makes it a spot on choice for CQB too. This in my opinion is a very good all rounder gun and is what I use as my 'MilSim' AEG as it is the only one I haven't customised with any pink gear but as you can see from the pictures, my fab sponsors JD Airsoft have laser etched my logo and call sign onto the body and mags. The Evo has a range of accessories available from magazine clips, branded mag pouches and the new hi cap magazine and if you are one for upgrading/customising your weapons, you can really make this your own. I have seen a lot of users opt for the M4 stock adapter and add real steel M4 stocks which look pretty badass. 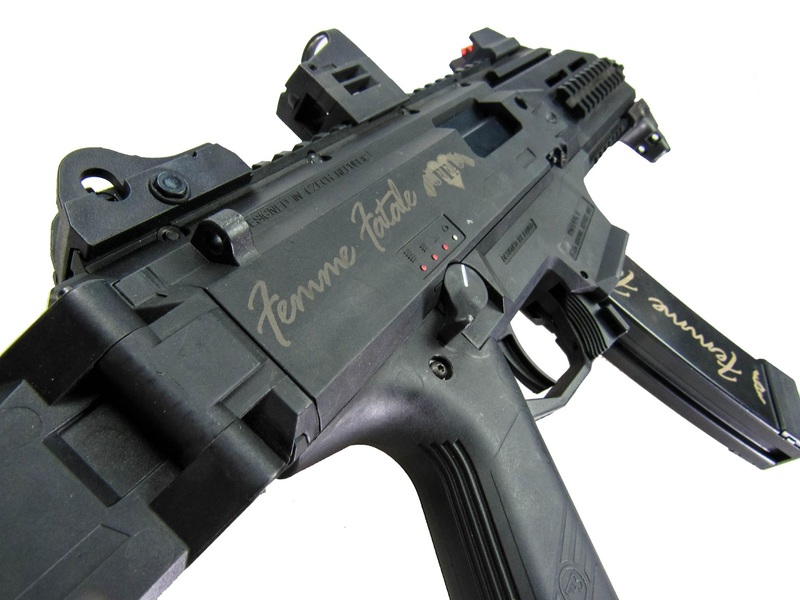 I really like the standard stock but I feel this will be a modification for my Evo in the future. Overall, I am exceptionally impressed with this gun, it performs very well and hasn't failed me yet. It is lightweight and compact meaning I can run it comfortably all day in both Urban and CQB environments with no need to switch weapon systems. A huge thanks to ASG for supplying me with this fantastic piece of kit!